These super easy and quick Bacon Wrapped Pineapple Bites will go quickly at your next party. 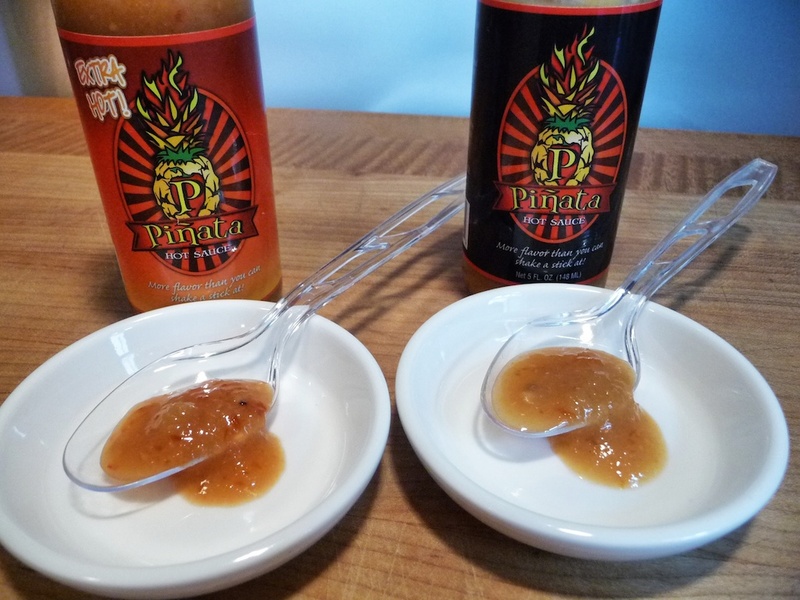 Pineapple and habaneros come together with some mustard, honey and garlic to bring you Pinata Hot Sauce. 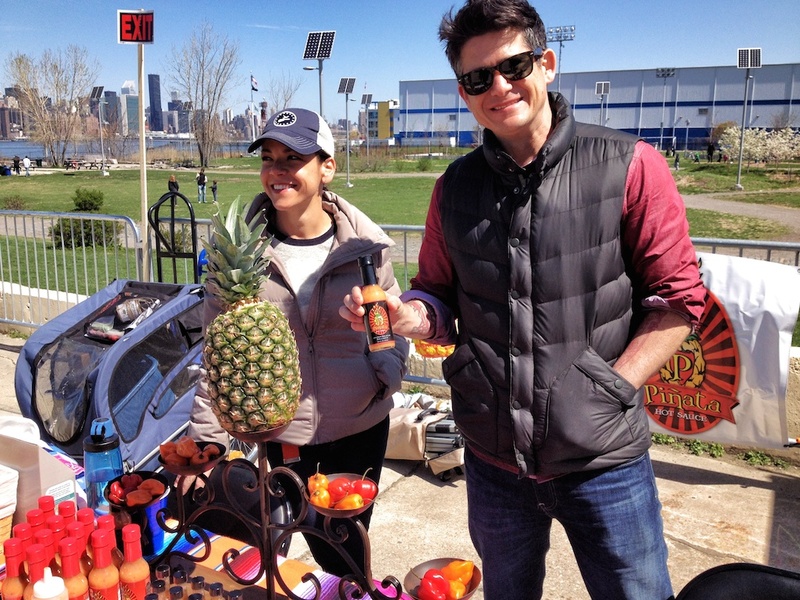 Based in Brooklyn NY, Pinata Hot Sauce was one of the first booths we came across at the 1st Annual NYC Hot Sauce Expo in 2013. Their sauces really impressed me, considering I’ve not been a fan of habanero based sauces until recently. Their motto is: More flavor than you can shake a stick at! I’m a sucker for anything pineapple based. 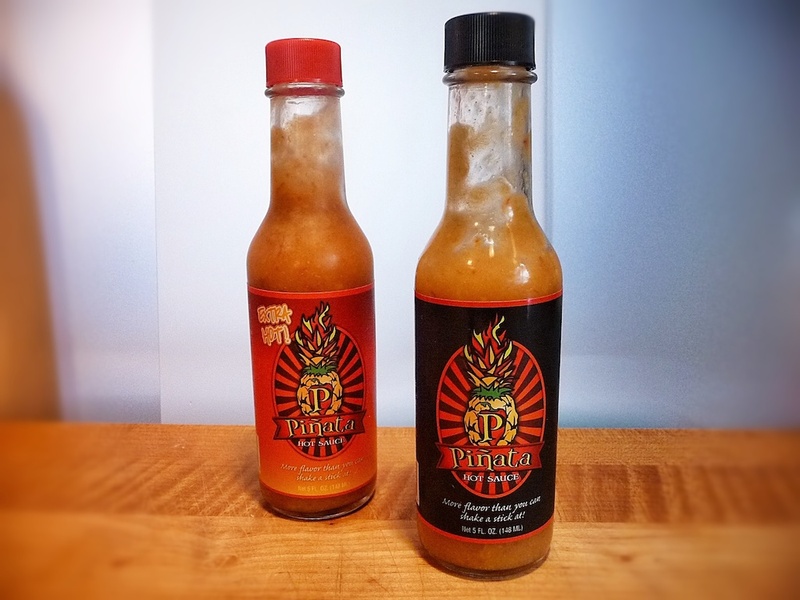 Come up with a good BBQ or hot sauce that uses pineapple, and I’m all in… at first. But can you keep me interested? Is it just pineapple flavor for the heck of it? Or does the sweet fruit really balance well with good quality chile peppers and supporting ingredients? In this case, I have say “Yes”. Check out this unusual list of ingredients. Ingredients: pineapple, vinegar, mustard, red habanero peppers, onions, honey, garlic, salt, water, xanthan gum. Mustard? Check. Red habaneros? Check. Onions and garlic? Double check. All good stuff, and the way Pinata combines these with pineapple makes a treat to eat. Texture & Appearance: Kind of green or yellowish green in color. This medium thick sauce brings with it a lot of things to bite on and enjoy in your mouth. Very small chunks of the fruits are a pleasing taste and mouth feel. Very nice. Taste Straight Up: Sweet and sour, tangy too. The mustard flavor is very muted; the big flavor here is garlic and pineapple and habanero chiles. Nice balance. Heat Level: – 1/5 Stars – Mild. Easily, this sauce would be a welcome addition for anyone to enjoy. Warm. Extra Hot version: – 2.5/5 Stars – Hot. Using the same list of ingredients, Pinata kicks it up with their Extra Hot version. Hot. Overall Rating: – 5/5 Stars. I would put Pinata Hot Sauce in the top 5% of pineapple based sauces, both hot and BBQ, that we’ve ever had. This delicious sweet heat sauce scores points in flavor, quality, looks and taste. Outstanding.